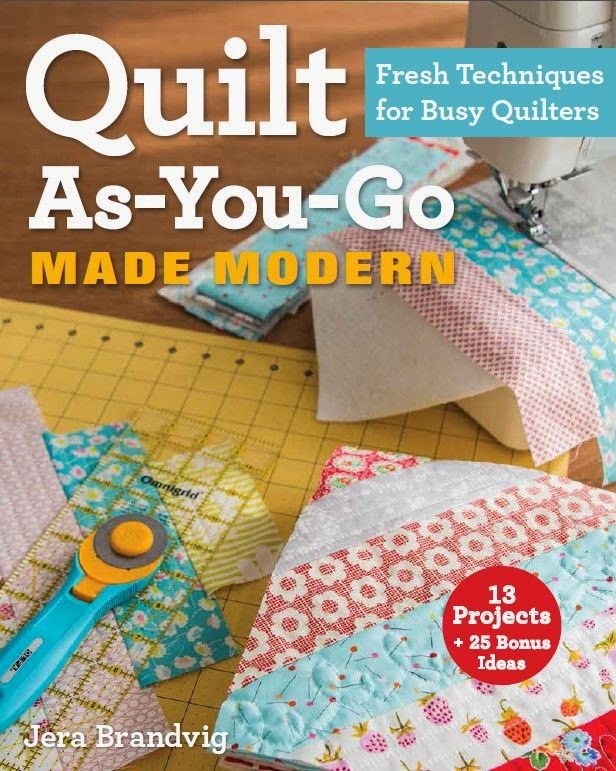 I used my modern Quilt-as-you-Go technique featured in my upcoming book, Quilt-as-you-Go Made Modern, in stores this September! Crazy to think that’s only a couple months away now. Laying them out and rearranging them is always fun too. 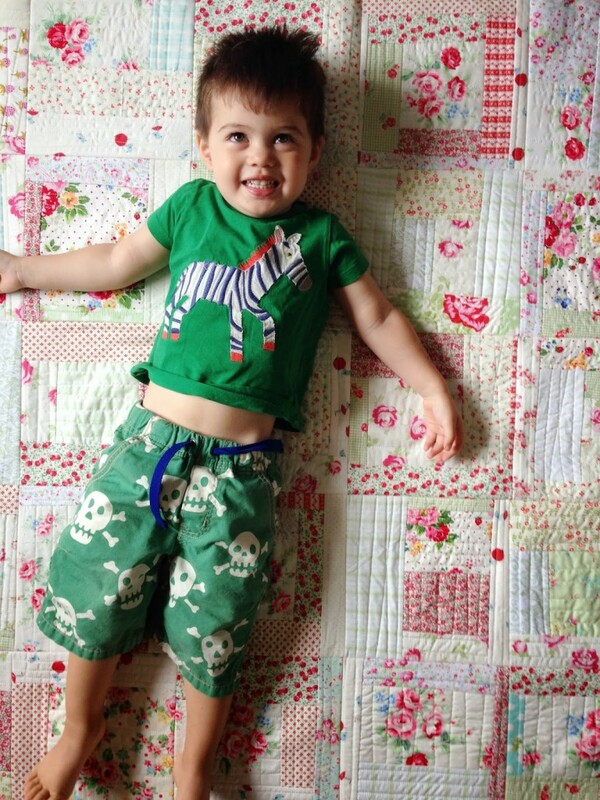 And here’s my big boy on a dainty, girly-girl quilt. 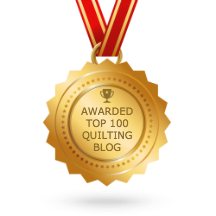 😉 Maybe my next quilt should have more neutrals and blues? 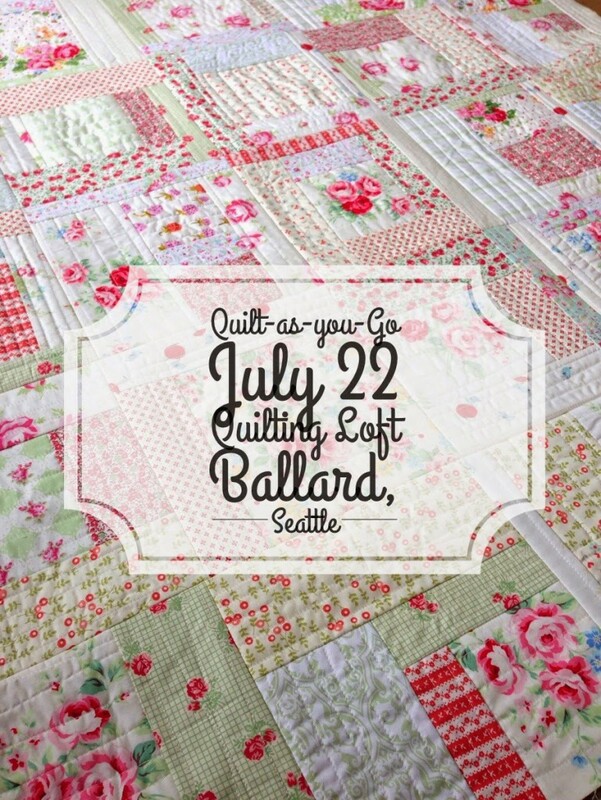 Also, I have an upcoming Quilt-as-you-Go class at The Quilting Loft in Ballard, Seattle. 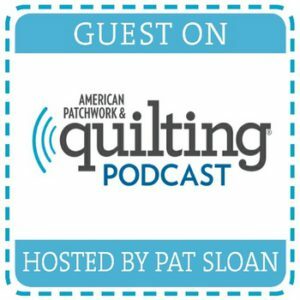 Register HERE and come quilt with me! 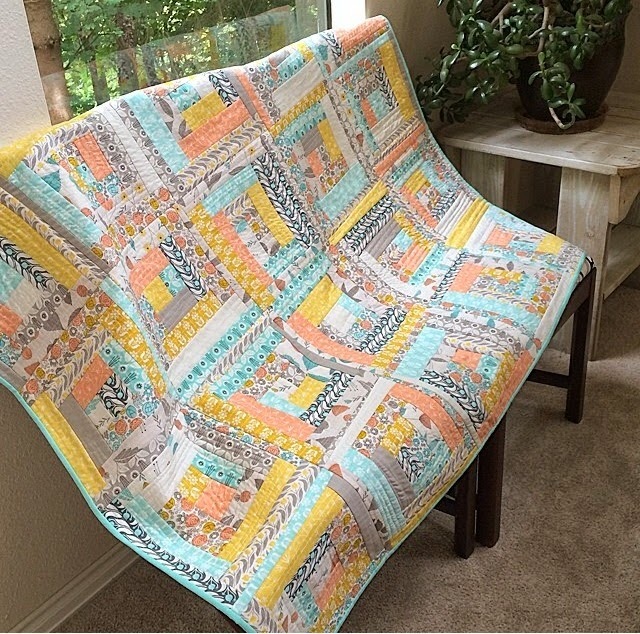 I wanted to share this beautiful picture of a Quilt-as-you-Go that one of my students sent me – she took my class at The Quilting Loft a couple months ago. This is by the lovely Sarah @oscarandthesparrow (on instagram). 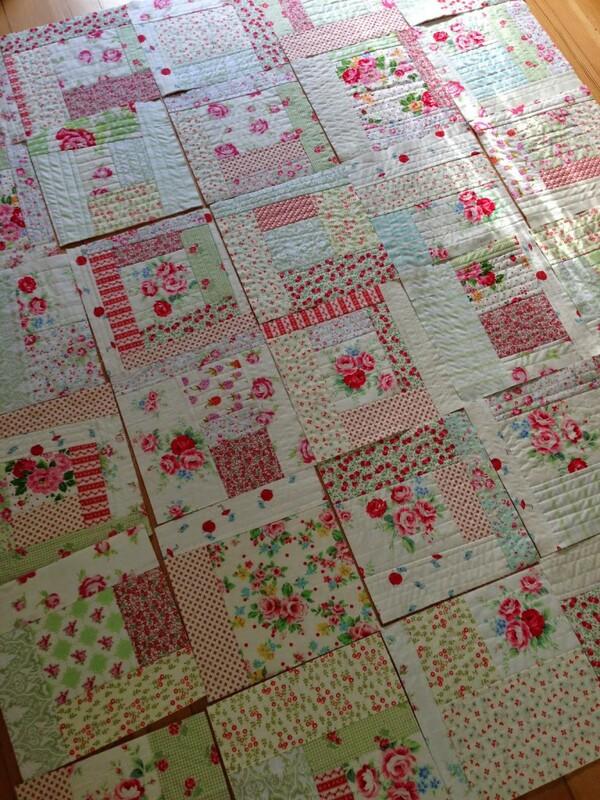 Isn’t is gorgeous…and even more impressive, can you believe this was her very FIRST quilt?! Anyway, thank you for stopping by. Just a quick post to share what I’ve been up to (as i try to type this up before my son wakes up!). And to brighten up your Monday, I shall leave you with some pictures of my furry child, Paige, modeling my latest. 😉 Have a great week! it’s been a beautiful Spring in Seattle! 20 Responses to Another one done, and another class! Gosh I would really love to come to Washington to take your class! Love the colors! I can't wait for the book to come out! A bit far for me to come to one of your classes unfortunately living in New Zealand. 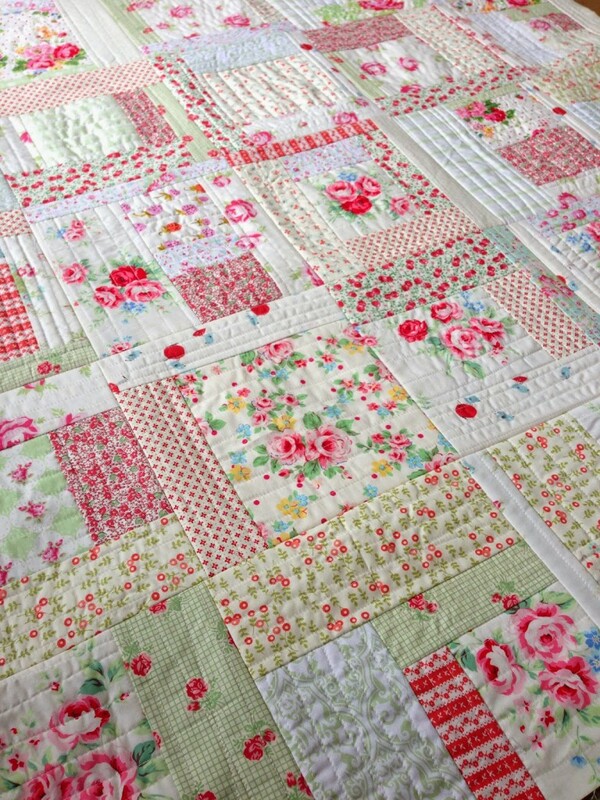 I wish I had better words to describe how much I LOVE this quilt! The fabrics and colors are gorgeous. 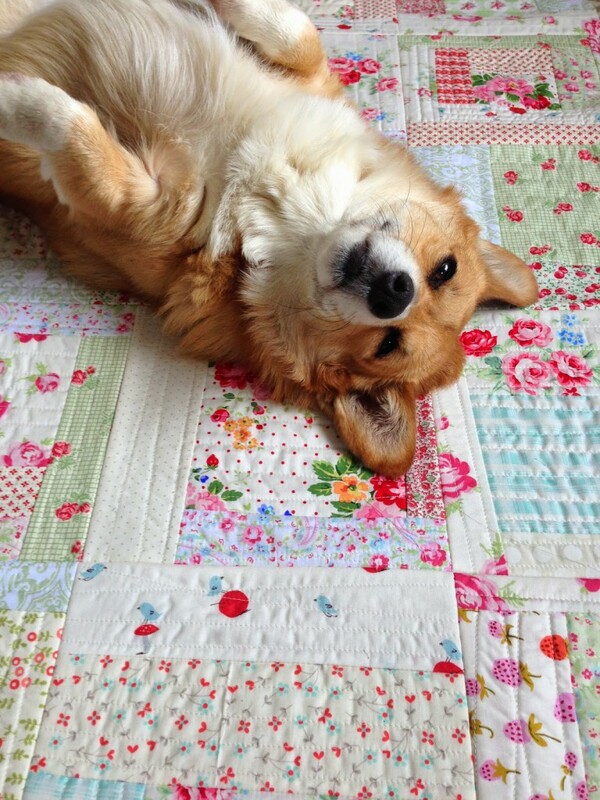 Paige is absolutely adorable and looks so sweet on this quilt. 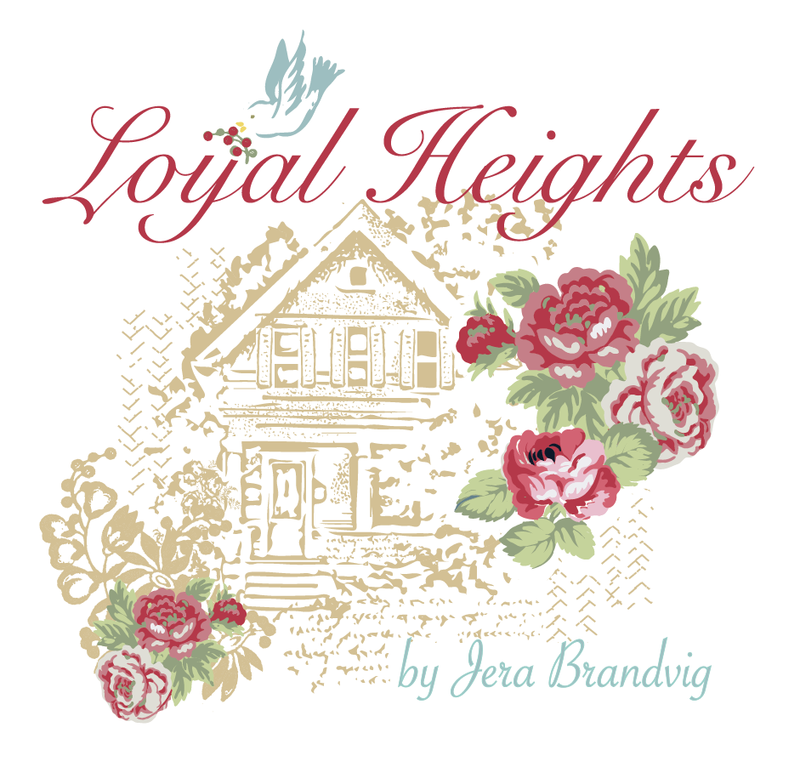 I am crazy in love with this quilt and wish your book was out already, so I could make this for our 6th. great grandchild, due the end of this month. Will you have a PDF pattern available? 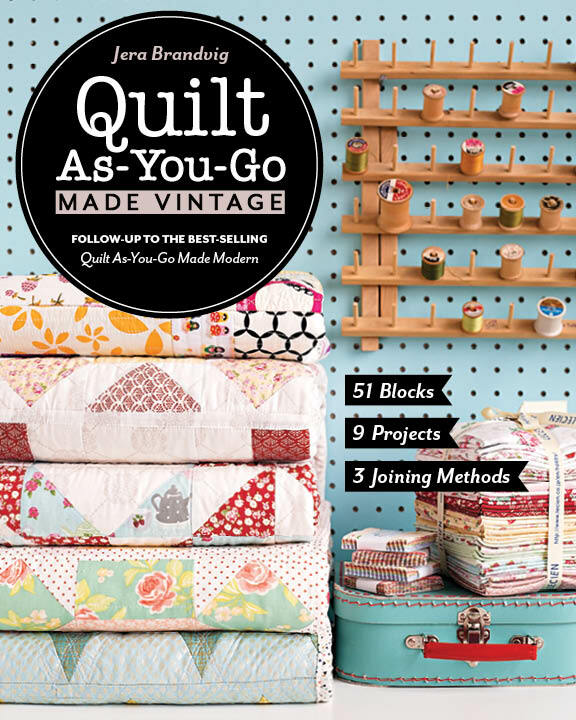 I love quilt as you go quilts because I positively stink at free motion and would much rather do a QAYG. Thanks so much for sharing. We are hoping for a little boy this time since we already have 5 little girls, but I love sewing little girliy things for them. This is really gorgeous. 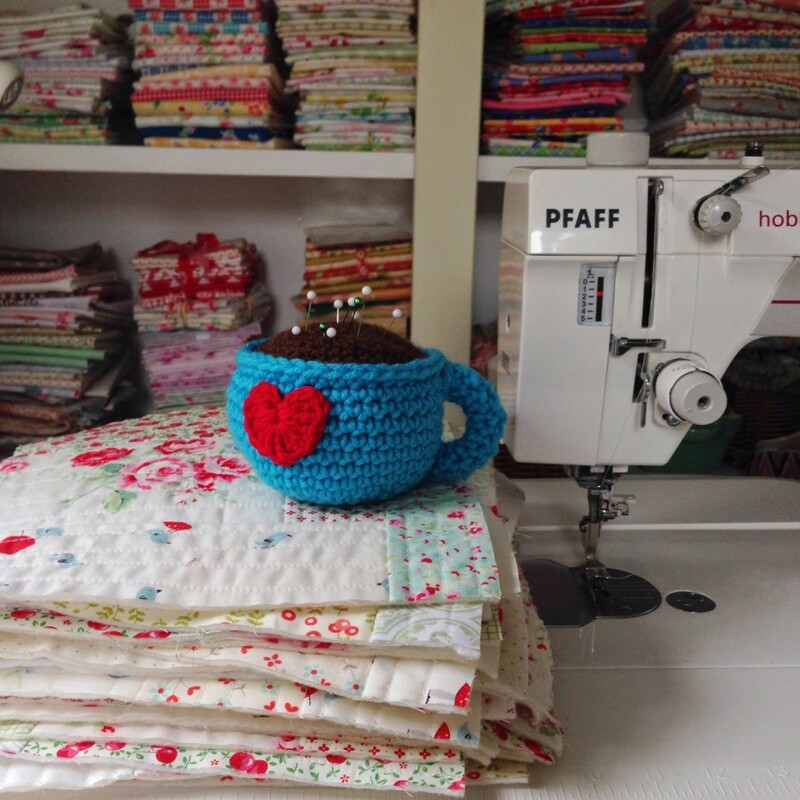 Lately I've been attracted to fabrics with an "old-fashioned" feel to them… what fabrics did you use? I see a bit of Briar Rose but what are the main flowery fabrics? 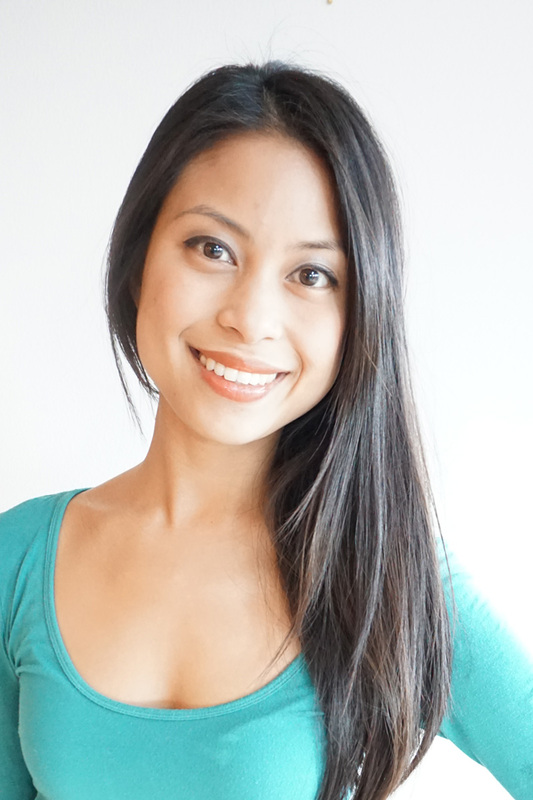 If I was in Seattle I would be signing up for this class tout suite! 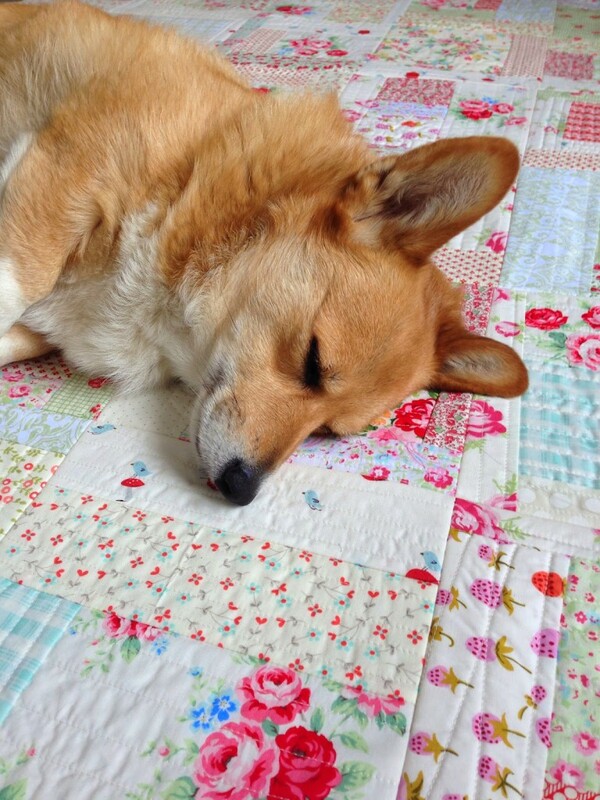 As always I love your quilt. Has a nice comfy vintage look to it. I also love the colors your student used. She was a fast learner. You have some cute models there. Love this quilt. Have your book on order. Paige loves it as well. WOW!! 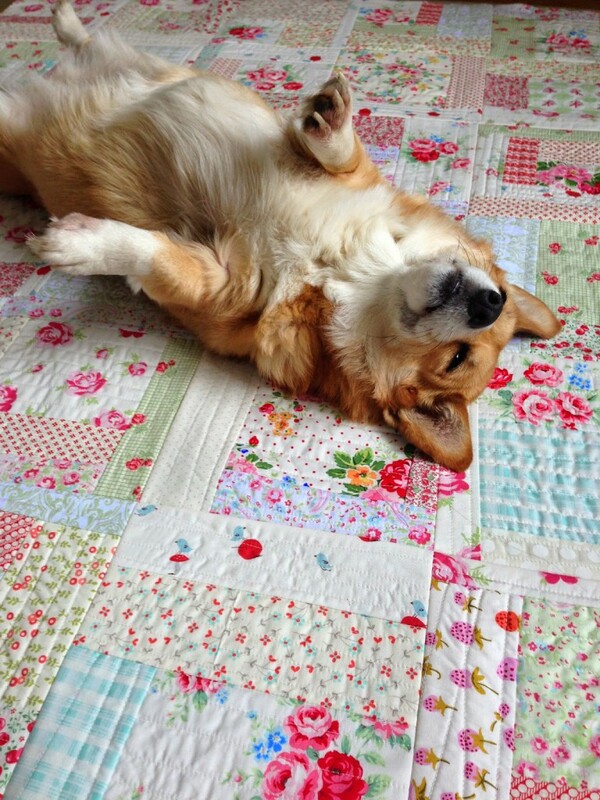 super beautiful your quilt. I always love your quilts and this one especially beautiful. I'm going to pre order your book immediately!! And you son and Paige are positively adorable – I want to hug them both!!! I just bought your book. Can you tell me which pattern this is as I do not see it in the book. Quite disconcerting. My daughter has fell in love with this quilt! Is there a pattern and where can I get the pattern? Looking at your quilting has inspired me to want to begin. Any advice appreciated? ?? I found this beautiful quilt while scrolling through Pinterest. Love the material! I purchased your book and can’t wait to get started. Anyway to find the fabric???? I hope, I hope, I hope!